As a result of a practice that combines varying scales, media and requirements, Oisin Byrne’s studio can be found both at home and abroad. He spent this summer working in a studio in Aadnestoe, Norway, a studio previously used by Edvard Munch and is currently practicing between Pickering Forest, Celbridge and a studio at his home in Dublin, which is where I spoke to him about his practice. 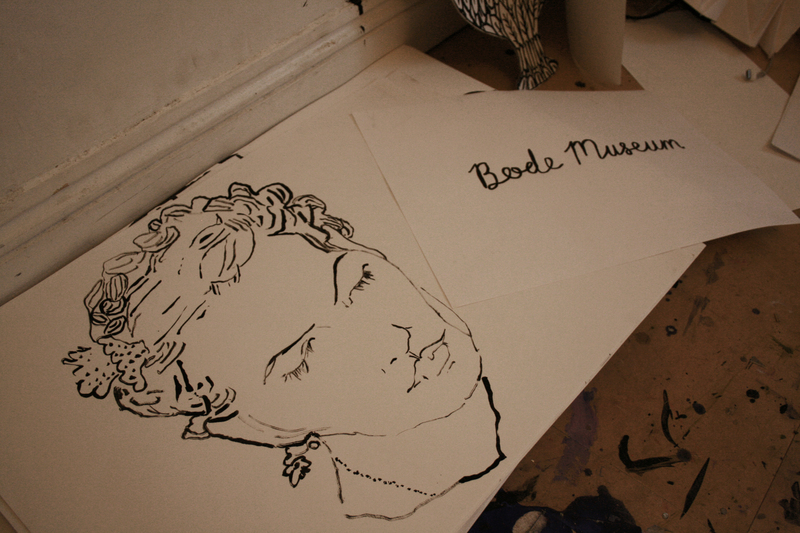 The basis of Oisin’s practice is drawing. Even his paintings, he considers in a way, to be drawings. He likes to use paper because of its portability, its versatility and because of the apparent contradiction of its characteristics; having such an ephemeral quality while at the same time the ability to be manipulated into a surprisingly strong material through the practice of origami and different methods of folding. He has worked across many different disciplines and has collaborated with a wide variety of professionals in various fields. He has worked with fashion designers, composers and astrophysicists to name a few. Beginning in 2008, he worked on a project with the head astrophysicist from Princeton University in the US. 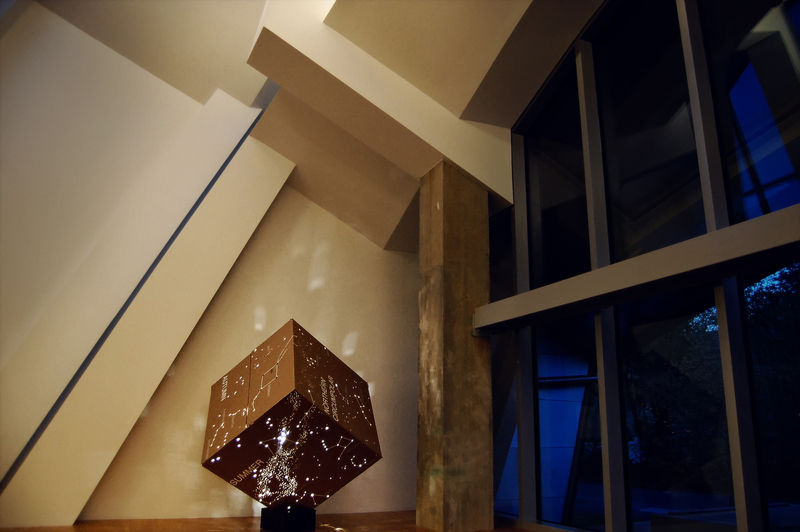 With this project Oisin and Professor JR Gott worked together to form a map of the universe projected into the shape of a cube. Gott produced maps and exact mathematic equations that allowed Oisin to relay the information onto two different cubes, one cardboard and one made from solid silver, both now on display at Princeton. Although this project was conceived of by Oisin, he sees it as a collaboration between artist and scientist. He says that every project he does with someone, including a portrait, he regards as a collaboration, although it is important for him that the different roles people undertake are defined. Recently Oisin was commissioned to do a drawing for the windows of a private residence designed by de Blacam and Meager. 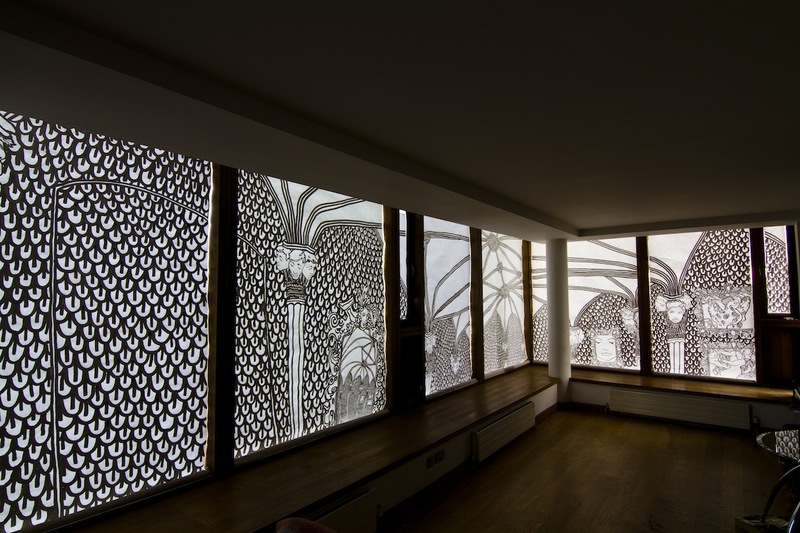 The project, entitled INHAUS, consisted of large scale drawings made as a temporary installation that were then hung over the windows inside the modern house. They could be seen from both the interior and exterior of the house and replicated a sort of giant light box. Oisin had been making drawings of the architecture in old houses for a while but he wanted to give drawing a more active or performative capacity in his practice. Because of the architectural nature of his drawings they were easily integrated into an interior space. Oisin also said that the placing of a drawing, or any work for that matter, is as important to him as the piece itself and because this work is site specific Oisin had an active role in the decision of placement. As he was working directly with the architecture of the building he had the opportunity to consider the drawings with regards to a more permanent placing in the world. “The general idea with it was to give a Gothic interior to the modernist cube”. A curator whom he has worked with a number of times, Padraic E. Moore, described Oisin’s production process as “rigorous, almost obsessive but meditative”. Oisin said that yes, there is definitely an obsessive element; “I don’t want to just draw someone once, I want to draw them 500 times”. He says that for him, the best way to think through his work is by ‘doing’. 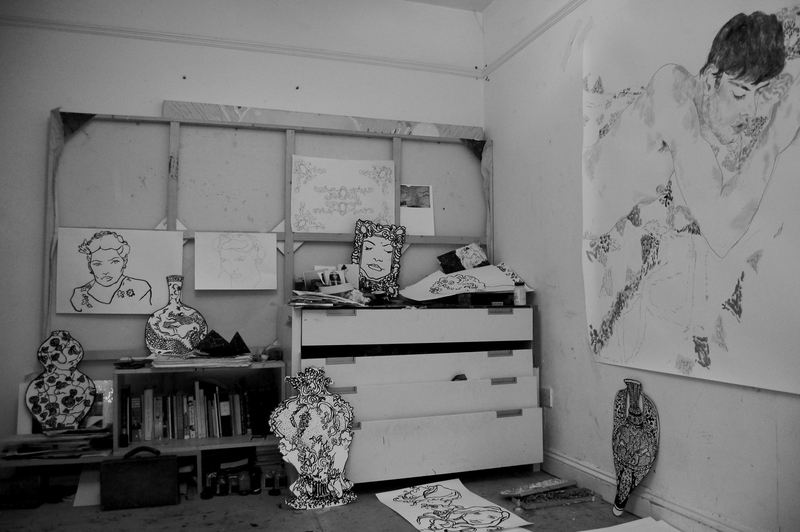 A glimpse into this production process can be seen in a project that Oisin did called The Paper Ball. This was a work that originated when Oisin was on The Space Programme residency at Castletown House. It was carried out three times before it became what Oisin had envisioned. The first time it consisted of a small group of people that were on the residency with him at Castletown House. The second time, as the centre piece of the business to arts award, acting professionals and opera singers were employed to make a large scale production, entitled White Out. The third time, in collaboration with a choreographer, a cinematographer and a cast and crew of over a hundred, it succeeded to be what Oisin had been striving towards. When he was on the residency, one of the things that impressed Oisin was the imposing architecture of the house and he wanted to explore some way of incorporating it into his work. 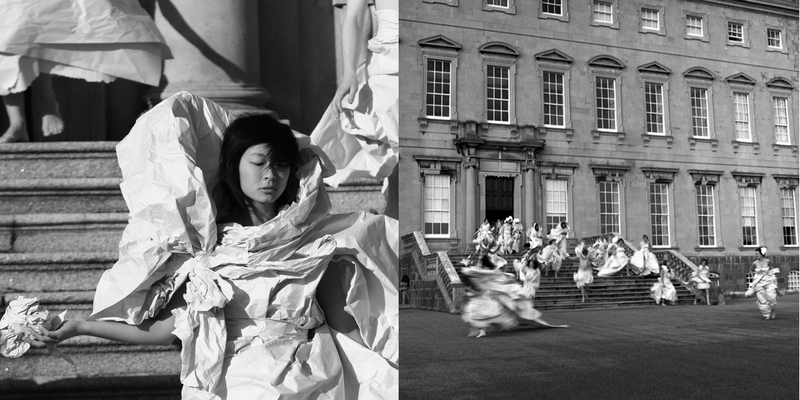 The final work is an elegant and fascinating scene where we see a large group of people dressed in white paper dresses streaming down the steps of the old house at Castletown. The work “counterpoints the relative permanence of the architecture with the ephemerality of paper.” The paper the dresses are fabricated from reams of blank newspaper and we see them unravel and disintegrate as the scene unfolds. Recently Oisin himself has started to actively participate in performance art. Recently, at this year’s Gracelands festival he performed as part of a piece called Manwatching. This was a work by Sarah Pierce and Vaari Claffey with music by Padraic E. Moore. This was Oisin’s first immersion into the role of performer. Two texts were read aloud and Oisin was required to make different gestures along with the readings; sometimes they would correspond to the text and sometimes they wouldn’t. It wasn’t choreographed exactly to the text and Oisin said that sometimes his actions generated a meaning on purpose; sometimes they did so organically.